It may be cold outside, but there is plenty to do this winter in Cape May. February is a great time for couples to get away and enjoy some romance and quality time. The weekend of February 10-12, is the perfect time to visit a cozy Cape May Bed & Breakfast like The Bacchus Inn B&B. Whether to celebrate an early Valentine’s Day or just to relax, The Bacchus Inn is a special place to spend a weekend. Each morning of your stay you will get to enjoy a hot breakfast and perhaps sit by a warm fireplace while enjoying an afternoon snack. As far as things to do while in Cape May, many of the fine restaurants are open on the weekends, as well as the shops on the Washington Street Mall. The Physick Estate museum house, the Cape May Lighthouse, area wineries, and trolley tours are all operating for business. If you are looking for something fun and different to help chase away the winter blues, step back in time to the Roaring 20’s, when we saw the birth of the Flapper, liquor was illegal, the popular dance was the Charleston, and Al Capone was enemy #1. The Cape May County Museum is hosting its second “Rum Runners Ball” on Saturday, February 18, at Congress Hall in Cape May. The evening begins at 6 p.m. with hors d’oeuvres and cash bar, followed by dinner and dancing. Tickets are $75 and are available by calling the Museum at 609-465-3535 or online by visiting the Museum website www.cmcmuseum.org and clicking on the “Calendar of Events”. Period dress is optional but encouraged. Prizes will be awarded for best costumes. Don’t forget to check out The Bacchus Inn “Specials & Packages” page for upcoming specials. Part 2 of 3: “The Competition Begins” – Lisa Matusiak of The Bacchus Inn Bed & Breakfast agreed to compete in the locally adapted “Chopped” cooking competition that took place on Thursday, September 15. The event was one of many Cape May Food & Wine Festival events taking place in Cape May from September 15-25, 2011. The competition challenged 6 participants to create a brunch dish using all the food items from the “mystery basket”. The items in the basket were not revealed until the competition began. Each participant had use of an electric frying pan, a limited pantry of cooking staples, and the items they brought, which included their knives, utensils, and bowls. The competitors were given 30 minutes to prep, cook, and plate 3 portions of the same dish for the judges to taste. The six competitors were Cape May innkeepers who are amateur chefs with no formal culinary training. The 3 judges for the event were David Craig of Lucky Bones, Chris Huber of Black Duck and Godmothers, and Jamie Kelly of Island Grill. At approximately 4:00pm, the commentator of the event, Jan Pask of CMHA, welcomed all the participants, judges, and the members of the audience. After all the introductions were made, Jan directed the participants to turn the electric frying pans on and to open the “mystery basket” in front of them to reveal the items they were required to utilize in their brunch dish. As the participants were still absorbing the items in the basket, Jan announced the 7th “surprise” item that was required to be used, a shot of Bailey’s Irish Cream! For a short moment Lisa considered drinking the shot, but then reconsidered and turned her attention back to the items in the basket and to what her next move was going to be. Lisa decided that this was going to develop into a French toast dish. So, while pondering the question of what to do with the strawberries, chocolate chips, pretzels, and the Bailey’s, she cut the bread into 3 thick slices. She then cracked 3 eggs into a large mixing bowl and added about a cup of half-n-half. As she added some salt and sugar, the idea of stuffing the bread with the strawberries started to sound good. So she put the egg mixture aside and cut up the strawberries. When she added the strawberries to the pan with some butter she concluded that the pretzels and chocolate chips would somehow get added in after cooking the French toast. Lisa took a knife and cut slits horizontally into each piece of bread and stuffed the cooked strawberries into the slits in each of the pieces of bread. She put the 3 pieces of stuffed bread into the egg mixture and allowed them to soak for a couple of minutes. This is when it occurred to Lisa that she could melt the chocolate chips to make a sauce, but what to do with those pesky pretzels? She added more butter to the frying pan and placed the egg-soaked bread in the pan to brown. Then Lisa poured the chocolate chips into a small metal mixing bowl with a little half-n-half. She placed the metal mixing bowl in the corner of the electric frying pan next to the slices of French toast, hoping the chocolate would melt enough to make a sauce. The commentator, Jan, calls out that the competition is 15 minutes in and that there is 15 minutes to go. While the toast was browning and the chocolate was melting, Lisa took the bag of hard pretzels and placed it on the table. She then picked-up her wooden cutting board and used all of her strength the crush the pretzels into the smallest pieces she could get, while thinking to herself that a food processor would make this so much easier! At this point, Lisa flipped the French toast and stirred the now melted chocolate chips. This seemed to be a good time to add the Bailey’s shot to the melted chocolate. After a couple more minutes, Lisa took the French toast off the frying pan and placed one on each of the three plates sitting in font of her cooking station. Then she took the chocolate off, too, thinking that she would return it to the heat right before serving to warm it up again. Now the frying pan was available to make a topping using the crushed pretzels, butter, and some “raw” sugar that was available from the pantry. Jan calls out “5 minutes to go”. Lisa spooned some of the topping onto each of the pieces of French toast. Lisa took the bowl with the chocolate sauce and placed it back on the heat and stirred it with a whisk. Jan announces, “2 minutes to go”. Lisa took the whisk and drizzled the chocolate sauce over each piece of French toast. Done! Jan then invited each participant to take their brunch dish up to the judges. When it was Lisa’s turn, Jan asked her to tell the judges and audience what she had made. 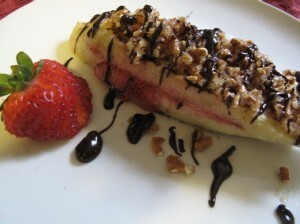 Lisa said, “Today I made Strawberry-Stuffed French Toast with a Crunchy-Pretzel Topping and Chocolate-Bailey’s Sauce”. She watched as the judges each tasted her dish and wrote down their evaluation of her dish on the score card. When all 6 of the participants’ dishes had been tasted, Jan asked the judges to tally their scores and determine the winner. As the judges came to a consensus, Jan gave each of the competitors a certificate for participating in this event. Then Jan asked the judges if they had made a decision, they indicated that they had. The winner of Cape May Chopped is … Lisa! Coming Soon – Part 3 of 3 “Celebrating the Victory”. Part 1 of 3: “Preparing for the Competition” – The Bacchus Inn Bed & Breakfast has reason to be proud this week as Lisa Matusiak, our chef, owner, mom, and wife, competes in the locally adapted “Chopped” cooking competition on Thursday, September 15. The event is one of the many Cape May Food & Wine Festival events taking place in Cape May from September 15-25, 2011. Lisa was invited to compete late Wednesday afternoon with a telephone call from Jan Pask, Vice President of Cape May Historic Accommodations (CMHA), after one of the participants dropped out of the competition. Lisa, although slightly apprehensive, agreed to participate. After making dinner for her family Wednesday night, she prepped the breakfast for the next morning, as she normally does. The breakfast for Thursday morning was Challah Bread French Toast, a sweet dish, for 11 people. After that, she spent some time Wednesday night with her recipe book and watched a little food network to help get her into the creative cooking mind-set. On Thursday morning, Lisa got JT, our oldest son, off to school. Lisa then did some work for The Bacchus Inn and took care of our youngest son, Ian. After making lunch, Lisa made an iron-on Bacchus Inn logo and ironed it onto a new apron purchased at one of her favorite stores in Cape May, The Cape May Linen Outlet. She then prepped her knives, bowls, and utensils that were suggested to bring by the event organizers and headed, on bicycle, to the “Chopped” event at the VFW hall on Congress St. in Cape May. Lisa knew little about the other 5 competitors because of her late entrance into the event. The only information that she knew was that all the competitors were Cape May innkeepers and amateur chefs with no formal culinary training. The 3 judges for the event were David Craig of Lucky Bones, Chris Huber of Black Duck and Godmothers, and Jamie Kelly of Island Grill. Each judge is a respected member of the culinary/restaurant community in Cape May. The competition offered each participant a mystery basket filled with 6 food items that were required to be used. Each participant had use of an electric frying pan, a limited pantry of cooking staples, and the items they brought, which included their knives, utensils, and bowls. The competitors were given 30 minutes to prep, cook, and plate 3 portions of the same dish for the judges to taste. Coming Soon – Part 2 of 3 “The Competition Begins”. Lisa and I picked up take out to eat at The Bacchus Inn bed & breakfast. We spoke with the owner of George’s Restaurant when we picked up the food. He told us they are filming tonight and tomorrow. Congrats to Goerge’s and Cape May. This is great exposure for all of us in Cape May.